Looking for that ideal location for a golfing break that won't stretch your budget to far....then why not try Roda Golf & Beach Resort short stays located on the Costa Calida. On Roda Golf course what could be better than that whilst you are on your holiday. We are great and finding the best property for your needs with 1st class accommodate for short breaks and long weekends for golfers and holiday makers. It does not matter whether you are after a property for 2 people or 30. This website offers a unique concept where owners network together to find availability for you with the owners direct. Keeping cost down to a minimum what can be better than that. Roda Golf has a great Club house on site with a first class restaurant where you can eat throughout the day, from breakfast, tapas or lovely evening meals. And soak up the atmosphere with evening entertainment in the summer months including Jazz bands and other live music. Murcia International Airport is about 25 minutes away by taxi or car and Alicante Airport approx 45 minutes away. The ancient City of the historic Cartagena is 20 minutes drive away where you will find some amazing shops, wonderful architecture and a beautiful marina and port for cruise ships. Murcia is the capital and only 30 min drive. For the Ladies how about the mud baths for the good feel factor and great fun too! Why not take the time out and treat your friends to a break by the sea taking up the rays of sunshine and a few glasses on sangria. 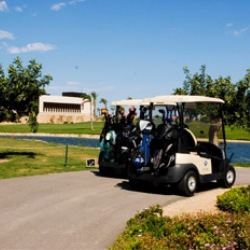 Roda Beach Golf resort is fantastic 18 hole golf course with properties around the perimeter it is on the Costa Calida which translate to be the warm coast. and it a great holiday location. Weather is fantastic for golf all year long. And for those of you that do not like golf there are lots of facilities for families, in the nearby town of Los Alcazares. Great restaurants and tapas bars all within a short walk. BBQ's on the terrace for the Alfresco feel book one of our townhouses close to all the facilities. Pool side villas available to rent direct from the owners . On those extra hot days why not hire a buggy and give those feet a rest special offers often available at the golf club. Check for details on arrival. Great for those that have mobility issues and the promenade is flat and great for a gentle stroll along the front. Stopping of for a beer and tapas on the way. Mobility scooters and strollers can be hired locally.